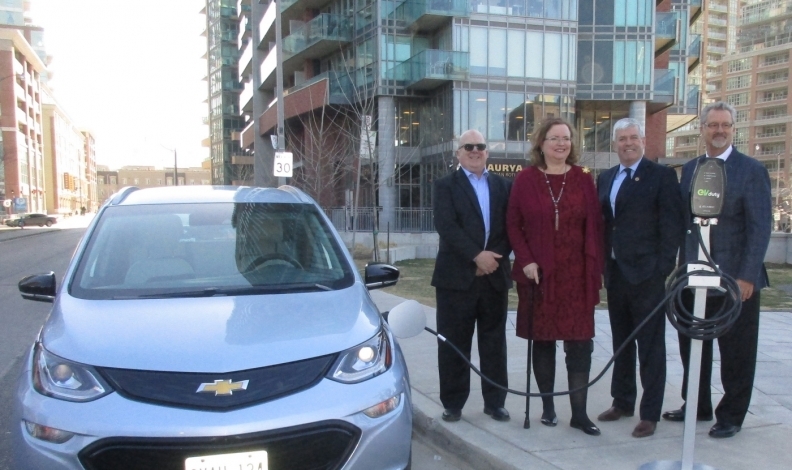 From left, Chair of the Condominium Authority of Ontario Tom Wright, Minister of Government and Consumer Services Tracy MacCharles, Arthur Potts, parliamentary secretary to Minister of the Environment and Climate Change and Assistant to the Minister of Transportation, and Aubrey LeBlanc, chair of the Condominium Management Regulatory Authority of Ontario, announce changes that will make the installation of EV chargers easier. TORONTO — Electric vehicles should be more appealing and easier to charge for Ontario residents living in condominiums beginning May 1, says the province. That’s when changes to the Ontario Condominium Act take effect, making it easier for condo corporations and residents to install electric vehicle charging stations, a move the province says will help increase sales. The new laws announced on Monday are designed to facilitate the installations of EV charging stations at existing condo properties. The government says it has received more 600 submissions from frustrated condo owners seeking to obtain condo board approval for the installation of chargers. But the Ontario Condominium Act, which was enacted in 1998 and has become outdated, and didn’t allow for the easy installation of charges at existing condo complexes. Growing sales of EVs and the Liberals’ commitment to its Climate Change Action Plan, announced in June, 2016, led to the changes. MacCharles said increasing the use of EVs was identified as a priority in an effort to reduce the province’s carbon emission. “The Climate Change Action Plan includes recommendations to establish requirements for producing condos [and] apartment buildings to make it easier to install electric vehicle charging stations,” she said. Arthur Potts, parliamentary assistant to the minister of transportation and the minister of the environment and climate change, told Automotive News Canada he expected the legislation change for condos to substantially increase the sales of EVs. “Ontario for the first time surpassed Quebec in the number of electric vehicles being sold last year,” he said. “You’re seeing a doubling of electric vehicles/hybrid electric vehicles [being sold] almost every year right now. At the moment it’s just over one per cent [of all vehicles sold in Canada], but it’s going to be two per cent next year and four per cent the year after that. Brad McDonald, senior policy advisor of the Ontario Ministry of Government and Consumer Services, said it would cost between $2,000 and $10,000 for an EV charger, including legal and electrical fees. He said any EV owners who showed they received a provincial rebate for buying an EV can receive an additional $1,000 rebate on their EV charger. The new changes will make it easier for condo owners to get approval from their condo corporations to install an electric vehicle charging system and prevent condo boards from rejecting an owner’s request to install and EV charging system on condo property when the owner meets certain conditions. And, in the reasonable opinion of the board, the owners would not regard the installation as causing a material reduction or elimination of their use or enjoyment of the units that they own or the common elements or assets of the corporation. If either of the above two conditions are not met, the board would need to provide a notice to owners that indicates the owners have the right to requisition a meeting (within 60 days of receiving the notice) to vote on the matter. Further details about the changes can be found on the government’s website.